All of our themes require the Genesis Framework in order to work. If you do not have a copy of this yet, you can purchase it right here. This is a one-time purchase and you can use it on as many sites as you like. It also includes lifetime updates. Download the Genesis Framework to your computer. Do not unzip the files. If your computer is automatically unzipping this file, you can right click and either hit zip or compress to zip it back up. Once you have this file saved to your computer, you’ll install the Genesis Framework to WordPress before you upload your Restored 316 theme. 3. Click the UPLOAD THEME button. 4. Click CHOOSE FILE, browse your computer and select the Genesis.zip file. NOTE: It may say Genesis.2.4.1.zip or something similar. 5. When the file has been selected, click INSTALL NOW. Do NOT activate the theme and move on to the next step! Once you have Genesis installed, you’re ready to install your new Restored 316 theme! 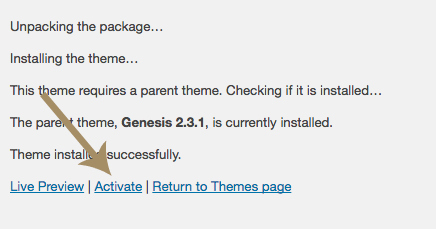 We’ll use the same steps we used to install the Genesis Framework, but this time we are going to activate the theme! Login to your account at Restored 316. Download your new theme to your computer. Do not unzip the files. Once you have this file saved to your computer, you’ll install it to WordPress. 4. Click CHOOSE FILE, browse your computer and select the Restored 316 theme file. 6. Click on ACTIVATE and your theme will be activated on your site. If you take a peek at your site now, chances are it looks nothing like our theme demo. We have just a couple more steps to get everything looking as it should!